Avast looks great, performs well, and has all kinds of extra features. It's also expensive. Avast is one of the more popular free, third-party antivirus programs. For anyone willing to pay for more advanced features, however, Avast’s premium products also have a lot to offer. At the top of the company’s line-up is Avast Premier for $80, which comes filled with features. Though it only offers two additional extras compared to Avast’s $60 Internet Security product, those particular features are potentially useful for those who want them. 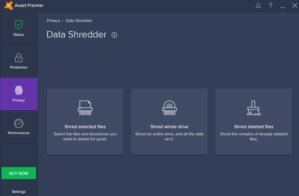 The first is Data Shredder, which deletes files by immediately overwriting them so they are not recoverable. The second is Software Updater, which automatically updates third-party programs, plugins, and utilities on your PC. Both are nice features, however, you can use free programs to perform the same functions—like FileHippo App Manager, which monitors and automatically updates your programs. Avast Internet Security’s “Status” section. Despite being packed with features, Avast manages to not overwhelm the user with a messy interface. The program uses a fairly standard design that includes a left rail with a pop-out menu, and a main screen that displays the settings and primary interface for each feature. The program also uses color effectively to help convey important information. The program’s primary background is a bluish gray, with the active section in the left rail highlighted in purple. Avast Premier features four main categories: Status, Protection, Privacy, and Performance. The Status section is pretty simple with a basic green check mark when all is well. The main interface has one button to run a quick scan for viruses. This is also the section where you can get direct links to Avast’s catalog of Android and iOS apps. Protection is where you can run antivirus scans, as well as get access to a roster of other security features. There’s Rescue Disk, which puts a version of Avast Antivirus on a CD or USB stick to more effectively scan and remove stubborn malware. 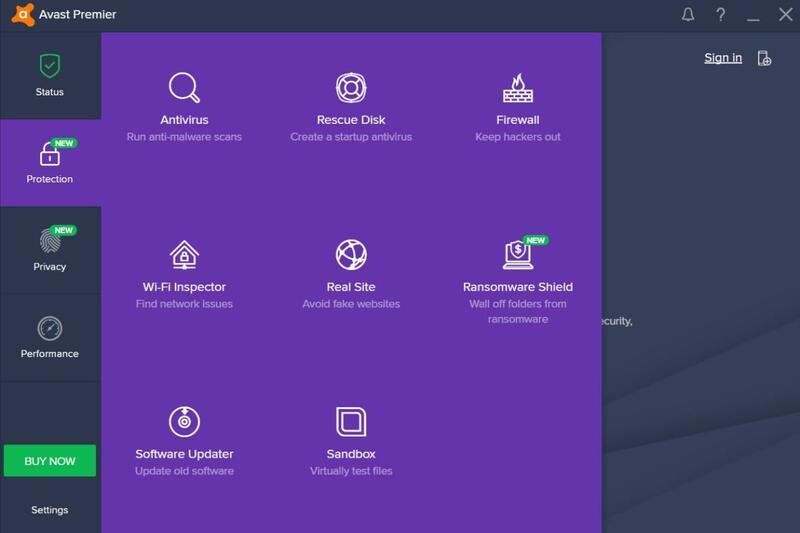 You’ll also find Avast’s firewall settings, a Wi-Fi inspector, Real Site phishing protection, Ransomware Shield (which monitors specific folders for ransomware threats), the aforementioned software updater, and a sandbox to wall off suspect files from the rest of your PC. The Privacy section includes Avast’s built-in password manager, Data Shredder, and Sensitive Data Shield. The latter probes your machine for important documents, and then it adds extra monitoring and protection to those files to guard against malware. It also acts as a quick access list of your important files. There’s also a link to SecureLine VPN, but VPN service is not part of the Avast subscription. Instead, your prompted to pay extra for the VPN. Avast Internet Security’s “Performance” section. Finally, there’s the Performance section with only two features. The first is Cleanup, which is similar to programs like CCleaner that scan your system for extra files, temporary folders, and caches that can be cleared. Although it looks like it’s included, Cleanup only scans your PC for free. To actually cleanup your PC, you need to shell out cash for Cleanup Premium. Performance also houses the settings for Avast’s gaming mode. 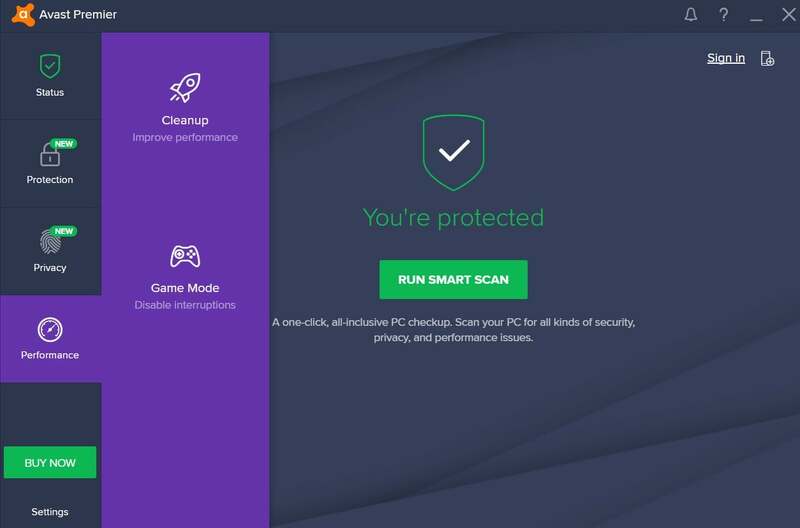 This feature automatically detects when you’re playing a game and forces Avast and Windows to reduce its resource footprint—allowing you to play your game unencumbered. 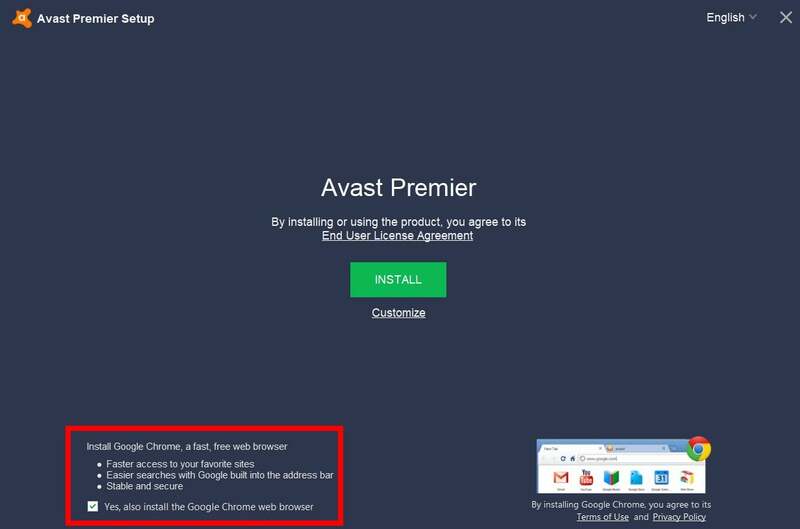 Avast Internet Security wants to install Google Chrome for those who don’t have it. Installing Avast Premier is very easy and using the free trial does not require you to register with the company. Ironically, Avast tries to install extra software at installation—something a security suite should guard against. In the case of our test PC, it was Google Chrome. On a system with Chrome already installed, Avast offered to install its own secure browser, SafeZone. Later on, I noticed that Avast installed two Chrome extensions: Avast Online Security and Avast SafePrice. I don’t recall explicitly agreeing to install either of them. Avast makes it easy to opt-out of this download, but it’s also easy for users to get a surprise Chrome install if they’re not paying close attention. As one of the top security firms, Avast performs very well. In A-V Test’s June test of zero days, web, and email threats, Avast scored a perfect 100 percent. Regular malware scans also did well, scoring 100 percent against more than 10,000 samples. Avast performed similarly high during A-V Comparatives’ evaluation. It scored 100 percent in the organization’s malicious URL test and 99.8 percent against nearly 38,000 malware samples. In A-V Comparatives’ offline test, that detection number dropped slightly to 98.8 percent. SE Labs gave Avast a AAA rating, noting that it and AVG were the most effective free products. Avast and AVG did fail to stop five targeted attacks in SE Labs’ tests. 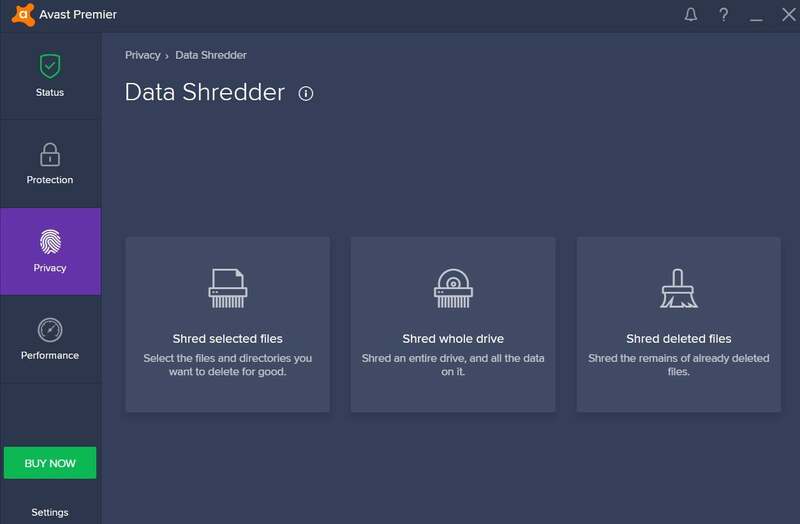 Avast Internet Security’s Data Shredder feature. During our benchmarks, Avast had no drop in performance. When we ran PCMark 8’s Work Conventional test—a simulation of web browsing, video chat, word processing, and spreadsheet editing—without Avast running, our test PC netted a score of 2517. With Avast running, it got 2515, which is well within the standard margin of error. In our more-punishing Handbrake test, our test PC typically takes one hour, fifteen minutes, and 30 seconds to transcode a 3.8GB MKV file using the Android Tablet preset. With Avast installed the file took one hour, fifteen minutes, and five seconds. We also looked at how Avast’s Sensitive Data Shield performed, since that feature is likely to be intriguing to most users. It did a good job, though there were a high number of false positives. For example, it included many Word documents in the “Employee documents” section likely because they were my old articles with company names in the title. Avast also inspected folders that weren’t even on my PC via the Keybase.io desktop program for Windows. That is admittedly an edge case as Keybase is a niche program. Nevertheless, if you are a Keybase user, turn off the program before scanning for sensitive documents. 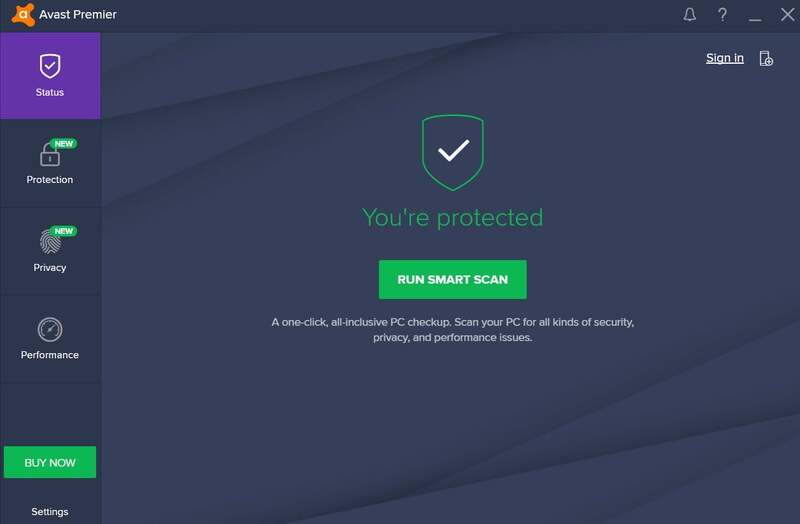 Avast Premier is a very well-designed program with all kinds of extra features that will appeal to security conscious users looking for more than just antivirus protection. But if you don’t mind the inconvenience, you can get an alternative that is almost equally as good for $20 less—Avast’s $60 Internet Security product is easily supplemented with free software to replace Avast Premier’s Data Shredder and Software Updater features. Keep in mind, though, that both options are only for one PC. If you have a whole household to protect, it’ll cost more. 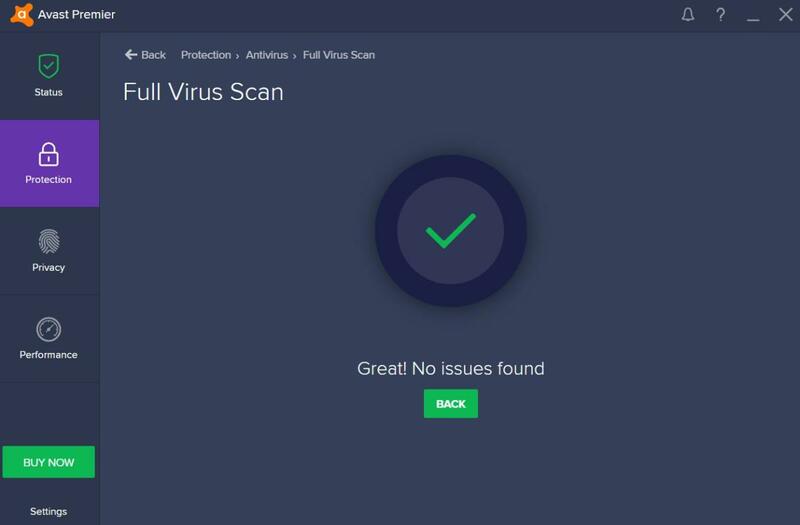 Avast has highly-rated virus and malware protection, a nice interface, and a ton of features that don't overwhelm. It's pricey compared to others, however, at $80 per year for a single PC.